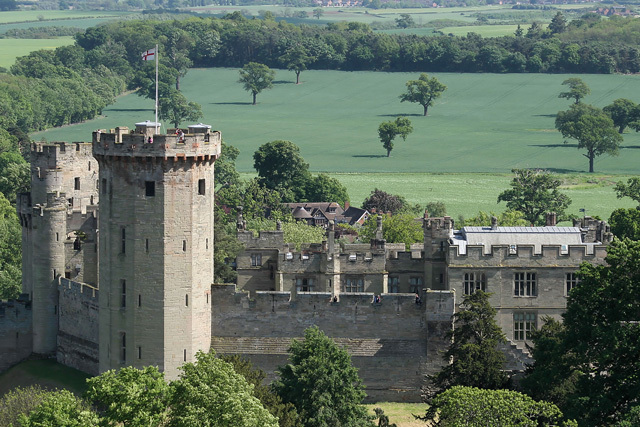 Notes: Warwick Castle is a medieval castle developed from an original built by William the Conqueror in 1068. Warwick is the county town of Warwickshire, England, situated on a bend of the River Avon. The original wooden motte-and-bailey castle was rebuilt in stone in the 12th century. During the Hundred Years War, the facade opposite the town was refortified, resulting in one of the most recognisable examples of 14th century military architecture. It was used as a stronghold until the early 17th century, when it was granted to Sir Fulke Greville by James I in 1604. Greville converted it to a country house and it was owned by the Greville family, who became earls of Warwick in 1759, until 1978 when it was bought by the Tussauds Group. Formal gardens belonging to Warwick Castle were first recorded in 1534.Landscaping in the 17th century added spiral paths to the castle motte during Fulke Greville's programme of restoration. Francis Greville commissioned Lancelot Brown to relandscape the castle grounds; he began working on the grounds and park in 1749 and had completed his work by 1757, having spent about 2,293 (270 thousand as of 2015). on the project. The gardens cover 2.8 square kilometres (690 acres). Robert Marnock created formal gardens in the castle's grounds in 1868-69. Started in 1743 and originally known as Temple Park, Castle Park is located to the south of the castle. Its original name derived from the Knights Templar, who used to own a manor in Warwick. Houses around the perimeter of the park were demolished and the land they stood on incorporated into the park. Attempts to make profits from the park in the late 18th century included leasing it for grazing, growing wheat, and keeping sheep. A water-powered mill in the castle grounds was probably built under Henry de Beaumont, 1st Earl of Warwick. By 1398 the mill had been relocated to just outside the eastern castle walls, on the west bank of the River Avon. Both mills were subject to flooding. By 1644, an engine house had been added to the mill. The mill was reused as an electricity generating plant after it had stopped being used to grind, but once Warwick Castle was fitted with mains electricity in 1940, the mill was no longer required and was dismantled in 1954.Adjacent to the mill is The Mill Garden which is privately owned but open to the public. Interesting views of the castle can be seen from this garden.